Hello and Happy New Year!!! Holy COW!!! It feels like I haven't been blogging in, like, FOREVER!!! So grateful to be hopping with my friends on the Stamp Review Crew to get myself started and motivated!! This week we are playing with Perfect Pennants ... I ended up liking this set WAY-WAY more than I initially thought that I would ... LOTS of things to do with it!! I finally got a chance to use my Bermuda Bay Sequin Trim, too!!! I swear I would buy that sequin trim in EVERY stinkin' color, if it were available!! I haven't played with the "On Film" framelits in quite a while, either ... so I had fun combining some things for this one! Next up?? The Delightful Dawn Tidd!!! (If you click on "Previous Blog" you will see the Happy creations of Holly Krautkremer!! I love the colors. So fresh and fun. I love these bright colors, Wendy! How fun to use this set with the photo frame and the touch of sequins is perfect! What a super cute card, Wendy! I love the patterns and colors you used. I love how you you used the On Frame Framelits. I love them every time I see them but I keep passing them up. You have talked me into them!!! 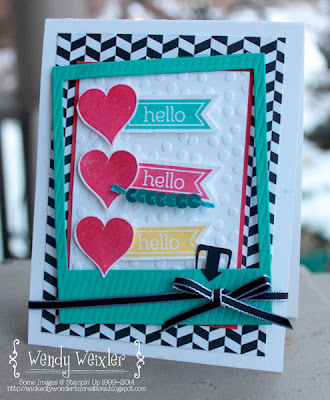 Love the hearts with the three hellos and the way you used the sequin trim is so clever! It really makes a nice little accent. I like the black background. It makes the rest of the colors POP! Adorable, Wendy! I love the bright colors. The Bermuda Bay sequins are the perfect accent! Awesome! What a bright and fun card Wendy! Love all the colours and the Bermuda Bay sequin trim. It's my new favourite too! Thanks for sharing! I love this Wendy! It fun and cute and the colors rock! Love the little touch of sequins on it too. You always add such fun details to your cards: the sequins, frame, clip - even the angle. I love that! Those colors look awesome grouped with black. Fun card! What a very fun card! I love these colors and how you used that frame die! Great details, too! Can always count on you to share a bright and colorful card....great! Always look for your bright, pretty and wonderful designs, great job! What a fun layout with the On Film die-cut and the hello hearts. Love it! Great card - all the elements work so well together. And I agree - I would buy every color they sold if they gave us more sequin options. The Bermuda Bay is just gorgeous! endy - this is bright and cheery! Love the color palette! Stamp Review Crew - Valentine Free-for-All! !